Western blot analysis of extracts from HeLa cells, untreated (-) or treated (+) with calf intestinal alkaline phosphatase (CIP)/λ phosphatase, and BaF3 cells, using Phospho-Pyruvate Dehydrogenase α1 (Ser293) Antibody (upper) or β-Actin (D6A8) Rabbit mAb #8457 (lower). 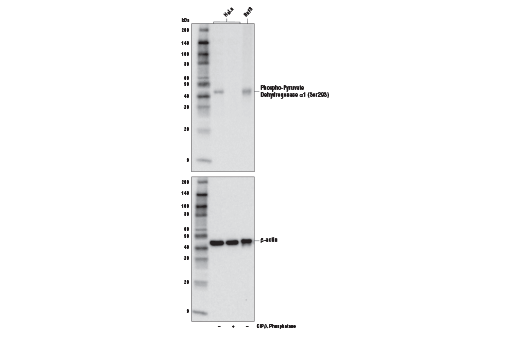 Phospho-Pyruvate Dehydrogenase α1 (Ser293) Antibody recognizes endogenous levels of pyruvate dehydrogenase α1 protein only when phosphorylated at Ser293 residue. Based on amino acid sequence comparisons, this antibody is predicted to detect endogenous levels of pyruvate dehydrogenase α2 protein only when phosphorylated at Ser291 residue. Monoclonal antibody is produced by immunizing animals with a synthetic phosphopeptide corresponding to residues surrounding Ser293 of human pyruvate dehydrogenase α1 protein. The pyruvate dehydrogenase complex catalyzes the conversion of pyruvate and CoA into acetyl-CoA and CO2 in the presence of NAD+. Acetyl-CoA then goes into the citric acid cycle where it reacts with oxaloacetate to form citrate. Acetyl-CoA is also used for fatty acid and cholesterol biosynthesis. The reaction of oxidative decarboxylation of pyruvate therefore serves as a critical link between glycolysis and the citric acid cycle and lipid metabolism. In mammalian cells, the pyruvate dehydrogenase complex is located in the mitochondrial matrix (1). This complex is comprised of three enzymes: pyruvate dehydrogenase (E1), dihydrolipoamide acetyltransferase (E2) and dihydrolipoamide dehydrogenase (E3). Pyruvate dehydrogenase (E1) consists of two subunits: α and β. This enzyme catalyzes the removal of CO2 from pyruvate. Mutations in the α subunits of pyruvate dehydrogenase (E1) lead to congenital defects that are usually associated with lactic acidosis, neurodegeneration and early death (2). Pyruvate dehydrogenase kinase 1 phosphorylates pyruvate dehydrogenase (E1) α1 subunit at Ser293 to inactivate its activity (3, 4). This phosphorylation contributes to the tumor metabolic reprogramming toward glycolysis in hypoxia by inhibiting the citric acid cycle (4). Strumiło, S. (2005) Acta Biochim Pol 52, 759-64. Stacpoole, P.W. et al. (2003) Curr Gene Ther 3, 239-45. Fan, J. et al. (2014) J Biol Chem 289, 26533-41. Chae, Y.C. et al. (2016) Cancer Cell 30, 257-272.